Let's chat about the Brave's pitching. There's no way I can have Matt, or probably many of you, agree with me, but I'm going to go out on a limb and say that I'd take the Braves pitching staff over any other staff in baseball. Granted, Roy Halladay, Cliff Lee, and Roy Oswalt are 3 of the top 10 pitchers in the game, but Tim Hudson, Tommy Hanson, and Derek Lowe aren't exactly slouches. For the sake of this post, let's get past the first 3 spots in the rotation and talk about starters 4 and 5. 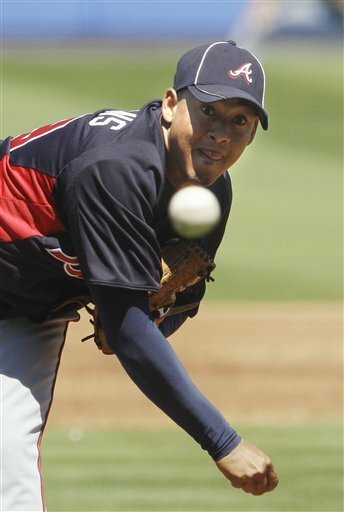 Jair Jurrjens is 25 years old and like Hanson, has his best days ahead of him. In 4 seasons, Jurjjens has compiled a record of 37 wins and 27 losses, a 58% winning percentage, averaging 14 wins and 10 losses a season. His lifetime ERA is 3.52 with opponents only batting .251 against him. Let's compare him versus Cole Hamels who has one more year of experience. 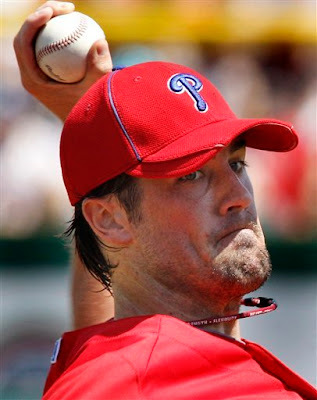 Hamels has a record of 60 wins and 45 losses, a 57% winning percentage, averaging 14 wins and 10 losses a season. His lifetime ERA is 3.53 with opponents batting .242 against him. Let's also point out that Hamels has had a more potent lineup with Ryan Howard, Chase Utley, Jimmy Rollins, and Jayson Werth than Jurjjens has had with Brian McCann and Chipper Jones. Come on, I'm a huge Braves fan, but let's be realistic, they haven't had the consistency the Phillies have had the past few years. Anyone still want to be so quick to trade Jurrjens? Not this guy for sure. Anyone who wouldn't take those numbers in your number 4 starter probably doesn't know too much about baseball. With a much improved line up, Jurrjens is due to have an all star caliber year, assuming he stays healthy. The more interesting part of this spring has been the battle for the 5th starter. 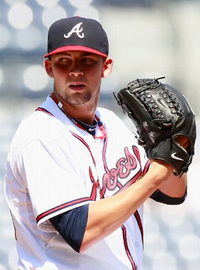 Mike Minor has killed it in the minor leagues. In 2010, his first full year, he had a record of 6 wins and 7 losses with a 3.44 ERA. Minor has struck out 146 batters in only 120 innings pitched. The former Vanderbilt star has held batters to a .217 average last season before being called up to the club where he set a rookie record of 12 strikeouts in one game. Minor has pitched well this spring, but despite his phenomenal numbers throughout his minor league career he was beaten out of the fifth spot in the rotation. 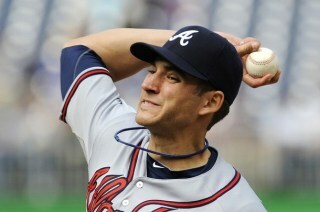 Rodrigo Lopez was signed by the Braves in an effort to resurrect his pro career. I don't have a strong opinion on Lopez, but I do think he's shown enough of a presence to get traded to another team and compete for a fourth or fifth starters role. The Braves could use this guy if they didn't have such an embarrassment of riches on their hands, but the truth is they Braves are in a great spot and Lopez wants to be on a pro roster. Kenshin Kawakami has been the biggest risk and biggest failure of the Frank Wren era. I don't want to say this guy doesn't have good stuff, but he's not a pro-caliber pitcher in the states. His pitches move enough, he has enough command, he has enough mound presence, but he hasn't been able to translate that to success in the major leagues. It's time to cut your losses and say goodbye to Kawakami. Just like Lopez, although I'd take Lopez any day over Kawakami, the Braves simply don't need him and he does not even come close to providing the stability nor the win factor to be the Brave's 5th starter. 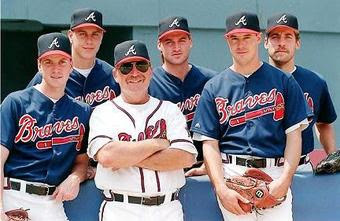 Let's face it, all of these guys have been beaten out by an undrafted rookie, Brandon Beachy. Beachy has been nothing short of a WOW for the Braves. Since signing, he has been lights out, showing pin point control, dominating movement, and a demeanor well beyond his years across all levels of the organization. Beachy has no doubt won the 5th starter role this year and though he may be pitching as an audition for another team, he provides the best chance for the Braves to win now. The catch of all of this is that the Braves have 5 including Minor and Beachy, of the top 10 pitching prospects in the game. Julio Teheran, Randall Delgado, and Arodys Vizcaino waiting in the wings. Think about the future rotation that could be Hanson, Jurjjens, Minor, Beachy, Teheran or Hanson, Teheran, Minor, Vizcaino, and Delgado. Put any of those five names together and you have a 1 - 5 rotation that may be the best to ever pitch together, including the Phillies 2011 staff and the Braves staffs of the 90's. As always, this is just one man's opinion, but the future looks bright.